One of the best aspect to owning your home is that you have full control over your decorating choices. This extends to how you paint or cover your walls and the colours that you may choose. However, many people are not aware that their choices are not merely an aesthetic choice. In fact, the colours and shades that you choose for your home could have a dramatic effect on how hard your split air conditioning system works and the overall energy efficiency in your home. Darker colours absorb between 70%-90% more of the radiant energy that they are exposed to compared to lighter hues. This means that rooms decorated in darker colours will stay warmer for longer if the sunshine is allowed in during a bright sunny day. At the other end of the spectrum, lighter colours actually reflect heat and take more energy to heat up under the same conditions detailed above. This means that darker colours are a better choice for heating energy efficiency, but before you paint everything black, read on. A darker wall will present a challenge if you need to keep a room cool unless the room has no exterior wall and few windows. The particular shade you’ve chosen may not have much of an effect, but there are some factors you need to consider. A darker wall will make rooms feel smaller and may not be to everyone’s taste. This particularly pertinent if you’re planning to show and sell your house. Potential buyers are enticed by light, airy spaces that feel inviting and neutral so they can envisage how they would decorate. If these factors are not an issue and you would like to go dark anyway, here are a few pointers. The key to keeping a darker room cool in summer is to limit sunlight at the hottest times of the day. This can be achieved with window coverings and treatments that will block the sunlight. Another key tip is to have a darker accent wall, but this wall should not be facing a window where it will absorb heat from the sunshine. As we hinted above, you can still enjoy some heat trapping properties without going fully dark. Using darker colours as striking aspect features on lighter walls can be aesthetically pleasing and more energy efficient. Walls could be lighter and other room features, such as door frames, window frames, light fixtures, and radiator, could all be painted darker. Most household paints have a Light Reflective Value (LRV) stated on the tin, the higher the number, the more reflective the paint is. This should factor into your choice as a lower LRV will absorb more energy and heat. If they are looking for a split system air conditioner, Perth residents should contact us here at Gas&Air. 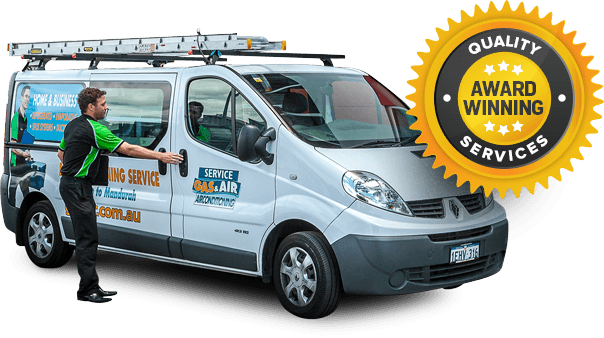 We can install, repair and service a wide variety of heating and cooling equipment, including a split air conditioning system. Perth clients will appreciate our commitment to professionalism and our attention to detail. Our team is standing by to discuss your requirements in greater detail, and they will be happy to answer any further questions or queries that you may have.